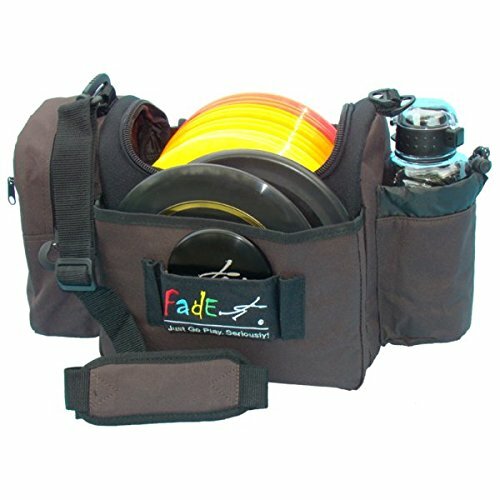 The FADE Crunch Box is a darn fine-looking, durable, 10-15 disc bag for everyday play. The Crunch Box is available in 6 different colors! You can search, but you won't find another bag with a feature list like this one at this price. Notice the side pockets. Fade Gear raised them up, away from the bag bottom so they don't drag on the ground and wear around the edges like other bags. Plus, we added some of those tiny little feet that really work well on a bag this size. They help keep the bag upright, because its no fun when your bag falls over. You can easily carry 12 discs in the Crunch Box bag, a jacket, a liter of water, your wallet, car keys, etc. The padded shoulder strap will keep it comfortable. Oh, and did we mention the empty bag only weighs just under 20 ounces! Heck, you'll need to put discs in it just to keep if from floating away in a light breeze! Rumor has it that Fade Gear has a crew of Howler Monkeys that test their bags harder than you'll ever use it! They've been thrown at trees, down hills, run over it with cars, slammed it in the baskets, and drug it through mud. Weighs less than 20 ounces! If you have any questions about this product by Fade Gear, contact us by completing and submitting the form below. If you are looking for a specif part number, please include it with your message.